Song given in flight: soft double whistle, loud sweet trill, a low whistle, and final higher note. Description: Sexes similar. 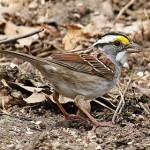 Fine brown streaking on grayish-brown head and back; grayish-buff unstreaked underparts; sometimes faint streaking is visible on lower flanks; grayish eye brow and mustache; whitish throat; large-billed; fairly flat forehead. 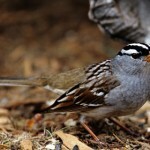 Long rounded tail is dark gray-brown, and conspicuous white tips on outer tail feathers are visible in flight. Juvenile has browner head with more streaking, and a streaked breast. Habitat: Usually found in arid grasslands with scattered shrubs, cactus, and mesquite. They are normally restricted to southern and western parts of the Plains region. 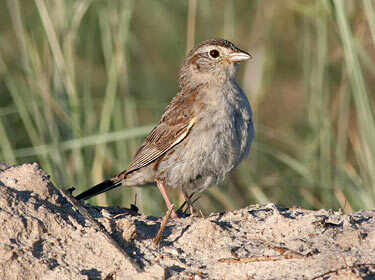 Where in Nebraska: Cassin’s Sparrows are irruptive, periodically moving north to breed. Generally a rare summer migrant in southwestern Nebraska, but in some years more common in others it is absent. Breeding records exist for only Perkins and Dundy Counties, however sightings have occurred also in southwestern Nebraska. 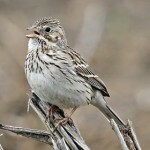 Field Notes: Cassin’s Sparrows are irruptive, periodically moving north to breed. They are normally restricted to southern and western parts of the Plains region. Fun Facts: Cassin’s Sparrow males display for females by flying straight up and then floating downward with wings outstretched, singing while they float down. This display is often referred to as “skylarking”.